I transferred my OS from time machine and everything mirrored nicely. Well my problem is this. I'm able to still cut from start to finish, but when it gets to the last cut the cutter will stop for a sec finish and stay at the last cut point (wont return to it's home point) and sometimes (seems random) it will keep the head locked down on the form it's cutting, resulting in me having to restart the whole machine. I played around with the Throttle and nothing changed (currently set at stop every 2 paths for 15ms). The other thing is, when I go to set the registration points, on the third point, I will press enter which in the past would send it back to the home point but now it just stays at the last reg mark and when I press enter to start the cut job, it goes back to the home point then starts. I'm pretty much sold on just going to SCAL at this point, but for right now I have a couple jobs I have to finish with MTC before I jump into SCAL. First issue... you need to still fiddle with the Throttle setting. As I recall, sometimes it needs to go to 2 and 30 or more? I really can't recall the most extreme settings. As for the Maxx not going home after the 3rd mark that was a bug that got re-introduced when Andy added the Maxx Air plugin and it screwed up the PNC for the original Maxx, yet was never fixed. This happens to a LOT of owners of the original Maxx, however, I don't recall it being something that happened to Mac users. For the PC owners, I keep an older version of the Maxx plugin so that they can install the older one and then everything is fine. But for Mac users, there are no separate plugins to install. So, first thing tomorrow, I'll go through my computer back ups and see if I can find an older Mac version from before Andy posted the latest one like 3 years ago or whatever and then load that onto my server for you to install. If that doesn't fix it, I guess SCAL is in your near future. Thank you as always for being the first to help with trouble shooting the problem. I will go for the higher throttle and see if that fixes the problem. It's not that big of a deal that it doesn't return home, since it has to be set manual each time. I'm looking at the new MAXX Solo & Duo that is coming out in September. I have had this KNKMAXX since November of 2012 and it has worked great this past five and a half years, but the auto registration for the new MAXX is a big plus since it will cut my setup time to almost half. I have been sitting on the SCAL program for awhile now (that $200 price tag is a little high) but I can look past the fact I'm being cheap because everything I have read and watched on that program lets me know it's well worth it. Are there functions in SCAL Pro you need versus the regular version which is far less expensive? And the fact the head doesn't return home before cutting a PNC IS a big problem because it's going to cut in the wrong place and, as I recall, you can't just change the calibration numbers to compensate for this because then the head won't be anywhere near the reg marks as you're setting each one. I'm going to test this latest Mac MTC (i.e. the one that came out a few years ago) on my older Maxx in a few moments and let you know if I get the same thing happening. Well, unfortunately, the MTC Bridge program can't find my Maxx connection. It's working fine from SCAL so it's not a matter of my USB cable or the driver. I guess something else has changed. MTC on my Mac seems to be working okay. But for now, I can't test this out for you. Thankfully it's still cutting in the right spots. It's not off registration. I'm cutting 5" x 3" die cut stickers and there are 12 up on a sheet and they have all been spot on. It's just rough because when it's finished cutting the head locks in place (stays down) and I have to reboot the machine after each finished sheet. My question about the SCAL regular version, does it have all the features that MTC has, or is there a feature I'm missing out on that MTC might have that the SCAL regular version doesn't? In regular SCAL, the Tiling feature is not present and you cannot cut longer than 6 feet. These two capabilities are, of course, available in MTC. All of the other extra features in SCAL Pro aren't present in MTC either. and very glad to read that your PNC is spot on! The Tiling feature in other words is muti cut images, am I correct on this? If so, I would have to get the SCAL Pro due to the fact everything I cut on our machine are anywhere from 12 to 32 images ganged up on a sheet, muti cuts of the shape image. 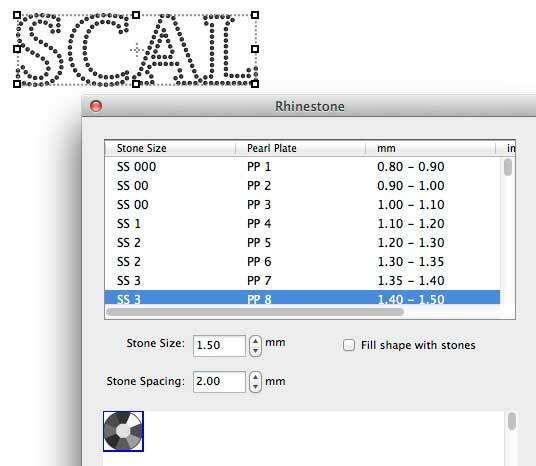 No, Tiling is the feature used to split up a design into parts that can be cut based on the maximum width of your cutter or the maximum width of the material being cut. Let's say you want to cut a big 42" x 42" tree out of wall vinyl for your family room. Being able to break up a shape that large into rectangles is feature that's in MTC but not in regular SCAL... only in SCAL Pro. Regarding cutting repeats, you can create a grid of repeats on the screen in SCAL or MTC. SCAL Pro offers one more option with regards to repeats whereby you can set up the repeats after you enter the cutting window. Great, that explains it well and thank you. 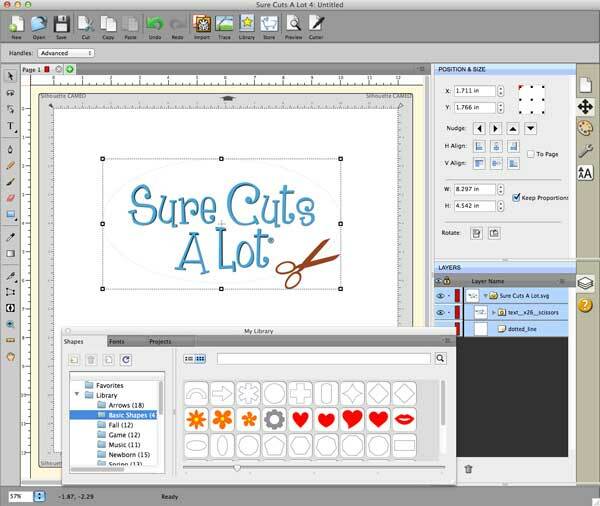 I create all my cut templates in Adobe Illustrator and import them into MTC as .pdf files. I can always upgrade down the line to SCAL PRO if it seems it's worth it, but would like to get the base model as long as I can do the same thing I'm currently doing in MTC. From everything you wrote, it reads as if I will be able to continue what I'm doing. Thank you as always for your time on this! Yes... great decision. As you stated, wait and see what you need because you can always upgrade for the difference in price. Includes over 200 built in shapes, with many more available through the eshape store. For print and cut applications, I can't think of anything that would be in MTC that would not be in regular SCAL5. One feature you MIGHT like to have in SCAL5 Pro over regular SCAL5 would be cut order control (although it sounds like you're not having any issues with losing accuracy over the course of the cut). Do you use your Maxx for anything else? Note that you'll need to adjust to a few differences in SCAL vs MTC, such as being able to adjust the offset of the reg marks from the project and assigning a layer to print only and not be sent to cut.. things like that. I have a user manual for the Maxx Air with SCAL which you can use as a guide, but I'll be here to help you, as well.